After a long long long journey, one that was surprisingly comfortable (yay, Air Canada), I arrived in Japan today. Erin met me at the airport, and we promptly got on a bus north. As I type this I am sitting on the Nikko line train at Utsunomiya Station. Someday I will be done with traveling for long enough to sleep on a flat surface and change clothes. At this point I have been on the move for 28 hours. Granted, 13 of them were on a very nice 777. And I napped on the bus. Tomorrow there will be landscapes and shrines and wonderment. 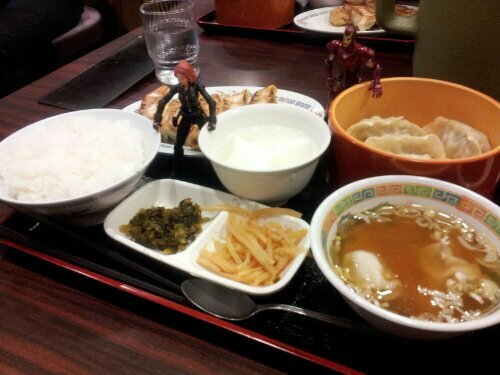 For now, have a photo of Iron Man, Black Widow, and some gyoza.